HomeMarketingRemarketing with Facebook: How Much it is Helpful in Customer Acquisition for your Business? “Adapt or Die” Start Your Online E-commerce Store Now! My mother told me about the Charles and Keith shoes she found online and how they followed her around the internet. She said, “It was so weird, I saw them on Facebook three times last week and thought they are in my fate. So, ordered them.” Pretty innocent lady. I did not tell her that it is not fate, it is remarketing. Remarketing has been a very effective tool, of which we all have been a victim somewhere in our lives. This tool is used by 9 out of 10 retailers and form an 88% part of their marketing mix. Remarketing is basically a tactic which helps you advertise to people who have visited your website and shown interest in your product or service. It works quite simple; visitors who visit a website, get cookied or tagged. A code is placed on the page that user visits and that trigger your ads to follow that cookied user around the web. So, when you see ads of your interested products on the side bars or top banners of other sites, do not think it to be a fate. It is simply remarketing. Facebook remarketing also works on the same concept. When you go through your Facebook feed, the ads pop up there to remind you of what you missing. Remarketing on Facebook really helps in boosting conversion and lowers the cost of customer acquisition. The biggest advantage of remarketing is that here you are sure of people who are interested in your product, you just take little extra efforts to pursue them more. 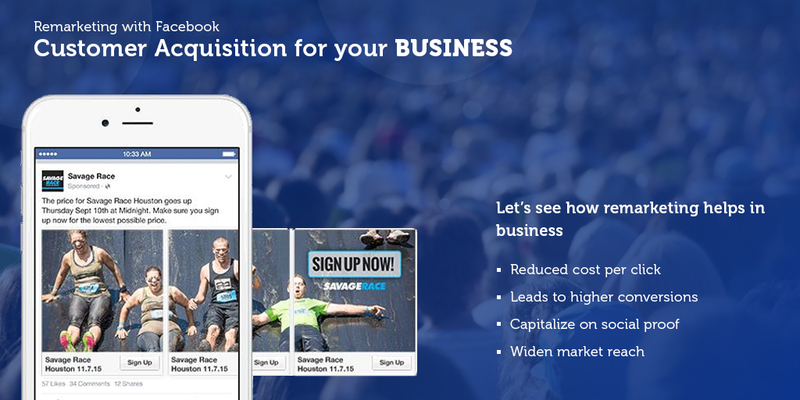 Let’s see how remarketing with Facebook helps the businesses. Reduced cost per click: Remarketing on Facebook usually has a lower cost per click when compared to remarketing on search engines. The reason being, on search engines you are looking for a given product or service while on social media, you are exposing the user to that ad while he is busy or wanting to do something else. Thus, that’s how Facebook ads are lower in price and can be as granular as you like. It’s just that one must use it to the best of their advantage. Leads to higher conversions: Converting first-time visitors into buyers takes time and especially if your industry is competitive then people are more likely to compare the products and price before making a final buy. In many cases, people visit your site, go away to another for comparison and meanwhile forget about your site. This leads to losing a sale. Here, remarketing about your website on Facebook acts as a good quick fix. Your brand becomes more recognizable and has greater chances of that visitor converted into a buyer. Capitalize on social proof: Do not just remarket to potential customers. Create a bigger showcase where you likely to catch current customers also. Happy customers often leave positive comments on the site and when a potential customer sees those comments via remarketing then he is likely to have a more positive impression of your brand. This really maximizes the chance of conversion and further increases the brand loyalty. Widen market reach: We have seen how remarketing with Facebook helps with existing and potential customers but through it, we can also cater to audiences who share same characteristics as of the current groups. You just have to create a custom audience in your Facebook Ads Manger which incorporates all those people who have visited a particular page on your website. This list belongs to all potential and existing customers. Similarly, you can leverage those lists to create a lookalike audience and can easily reach the new set of potential customers that were missing out. Thus, Facebook remarketing results into a substantial increase in sales along with a simultaneous decrease in customer acquisition cost.